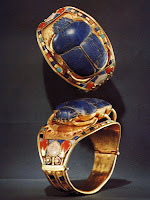 By design, scarab amulets were made to look like a scarab beetle. They could be worn as jewelry or chiseled into tomb walls. How were scarab amulets used? People drew scarab symbols on tomb walls. They made decorations out of them. Most of all, they made scarab-shaped protective amulets out of gold or precious gems and stones, or simply out of painted clay. They could be worn as jewelery. Often amulets were buried with a mummy. The amulet was placed over the mummy's heart, with a magic, protective spell inscribed on the back of it. Scarabs could help with your final "judgement test". Egyptians believed that when you died, your heart was heart weighed on a big set of scales by Ma'at, the goddess of truth. If your heart was heavy with sin, you failed and could not go to the afterlife (pretty awful!). If, however, your heart was light, you could safely move on. The scarab beetle could give you a bit of help, though. You could have one put over your heart when you died for protection against the weighing of the heart ritual. The scarab would hopefully convince Ma'at that you were good and that you deserved her mercy. 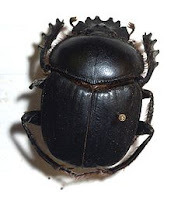 What do scarab beetles look like in real life? You can find live scarabs crawling around pretty much anywhere in Egypt. They're big and black, with smooth shells and spiky legs. Sometimes, you might even see them pushing around a little ball! What's the ball that scarab beetles push around? The ball is actually made of animal dung. Why do scarab beetles push around balls of dung? When a scarab beetle decides to be a parent, they lay their eggs inside some animal dung. The beetle then moulds the dung into a neat little ball. The ball that contains their eggs can be easily rolled around. That way they can take their unhatched babies with them wherever they go. It's actually pretty clever. 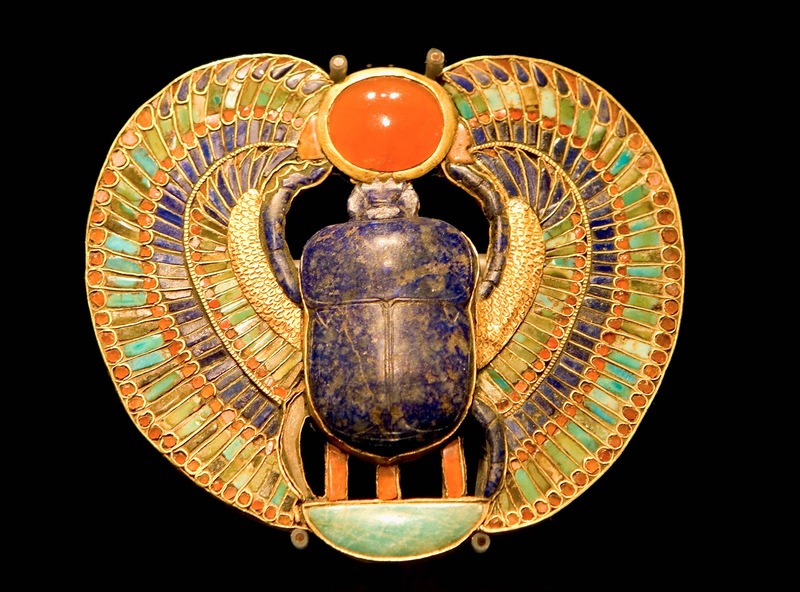 Why did scarab beetles become sacred? When the eggs hatch, tiny babies run out of the ball. To anyone watching, it looks like the babies magically appear out of nowhere. 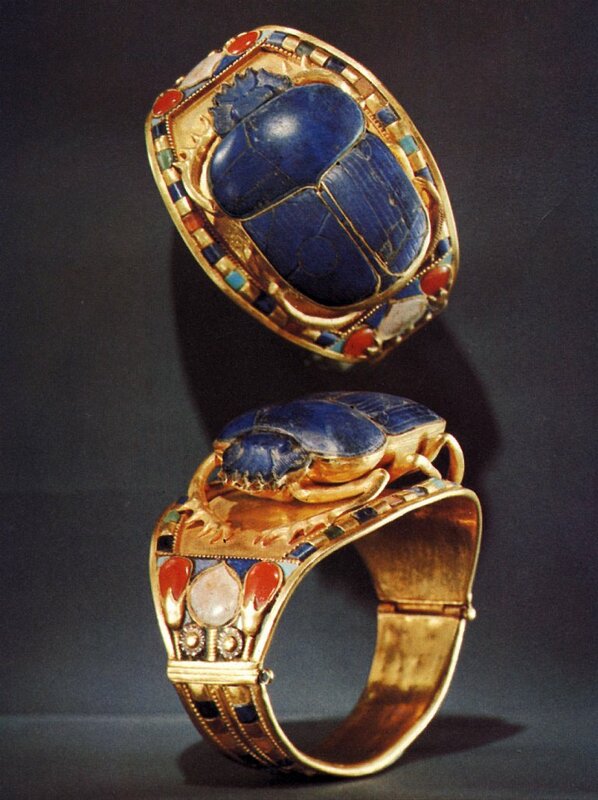 Because of this, the scarab beetle was believed to have magic powers. The beetle symbolized creation, life, and even rebirth. It was associated with the creation god Atum. Besides creation and heart protection, what meaning did the scarab have? The scarab pushing his little ball also reminded people of the sun moving across the sky. It was said that Khepera, or Khephri, the scarab beetle god, was above them pushing the sun ball along on a daily journey. Were people cursed by Tutankhamen's scarab amulets? Apparently, a paperweight from King Tut's tomb was given to Sir Bruce Ingham as a gift. This was no ordinary paperweight, however. It consisted of a mummified hand. A rather gruesome gift. "Cursed be he who moves my body. To him shall come fire, water and pestilence." Here's the astonishing part: After Sir Ingham received this spine-chilling gift, his house burned down. Even stranger, when Sir Ingham rebuilt his house, it suffered a flood. Curse or coincidence? No one really knows for certain.